Prior to learning about the Mindshift App, I would recommend to patients with moderate to severe mental health issues see a psychologist or registered counselor. Unfortunately many patients are not able to afford this or make the time commitment. Some patients are just plain embarrassed to seek help from allied professionals. Sometimes I would recommend reading material depending on the patient’s condition. I often felt frustrated by these complex cases and was challenged by finding the right resources to offer my patients. In addition, the enormous volume of resources overwhelmed me as I was not sure which information was evidence based. The Mindshift App was developed by Anxiety BC (a non-profit organization) and the BC Mental Health and Addiction Services (division of the Provincial Health Services Authority). I started to use it after I received a pamphlet in the mail. I easily downloaded it to my smartphone and quickly realized how useful this would be for many of my patients. The App can be downloaded from iTunes or other App smartphone platforms for free. Look under “Mindshift”. A common feature of many apps is the way developers or third parties silently track data and the user of the app. Tracking does not occur with Mindshift so patient privacy is fully protected. For most of my patients with a mood disorder, insomnia or even chronic disease, I now recommend the Mindshift App. 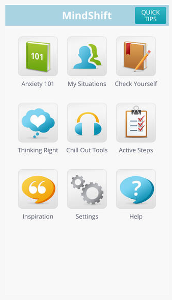 Even though this is specifically for people with anxiety, I recommend patients use the chill out tools section on Mindshift. This is my favourite feature. The chill out tools are a set of relaxation exercises, visualization activities and mindfulness strategies. All of these categories have either a male or female voice that directs the listener through the program. I specifically direct my patients to the mindfulness strategies. Mindfulness is the awareness that emerges through paying attention on purpose in the present moment and non –judgmentally to things as they are.1 Patients may practice a body scan or mindful breathing. The body scan is a 9-minute meditation that helps patients become aware of body sensations in a curious and non-judgmental manner. The mindful breathing is a 4 minute guided meditation. I have found the Mindshift App is a wonderful resource for my patients. This app was developed initially for youth and young adults, however I have seen how valuable a resource it can be for all patient populations that can navigate a smartphone. I typically spend one minute in a ten-minute office encounter to explain and navigate the Mindshift App to patients. Mindshift allows users to access a resource at any time and anyplace. This really is the ideal patient self-management tool. I always schedule follow up visits to review the patient’s medical condition and a quick check in to review how a patient is managing the Mindshift App. In the past year that I have been recommending the Mindshift App, some of my patients have reported to me an appreciation for using this tool along with a new sense of optimism. I was introduced to this at the St. Paul’s conference last Fall. I have recommended it to a few young people, but hadn’t spent much time on it personally til today. It’s really quite a useful resource for many situations and people of all ages. Wouldn’t it be great if all these wonderful medical Apps were listed somewhere, perhaps through the College or Medical Association, each with a brief review, rather than the chance encounter of a new App through an article, or seeing a colleague tapping away at something interesting on rounds? Thanks for calling attention to this wonderful app. One of my patients recently showed me the “booster buddy” app which I think was created through VIHA. It is great for younger kids as it has games and tasks and emojis. With each task completed, you get coins to buy clothes and accessories for your emoji. Some of the tasks include creating a safety plan (which is personalized and stays in your phone, so therefore always with you) or finding the phone numbers for crisis lines. It sounds exactly like what I need for my patients. Thank you for sharing that app. I have reviewed this app and agree that it may have some value in my practice. I will try using it with suitable patients. I did not know much the app.